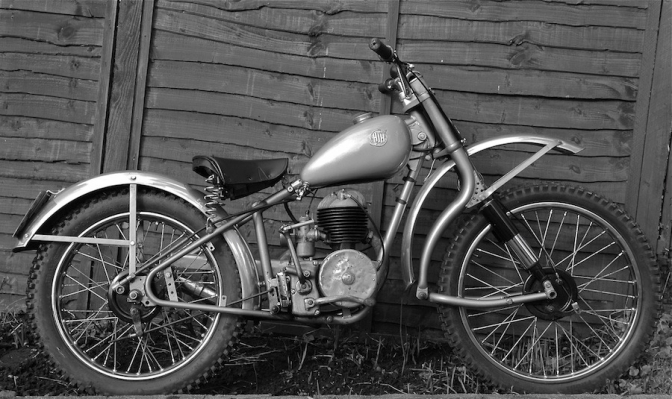 The Story of HJ Hulsman Motorcycles made in Wales from 1954 to 1956. HJH Motorcycles. Made In Wales. This is the story about a little known motorcycle brand that should have been a bigger part of motorcycle history if the finances had have been there to fulfil the 1000 orders received after just one show. HJ 'Hussy" Hulsman was the force behind the project setting it up with £1000 borrowed from friends in Wales in 1954. I will let the guys that were there tell the story below before I go any further. Firstly thanks to Jim Switzer for putting me onto the story.and Howell Evans. for giving me the permision to use the material from the Bridgend and District British Motorcycle Club. H.J.Hulsman Industries . Canalside works, Canal Road, Neath . 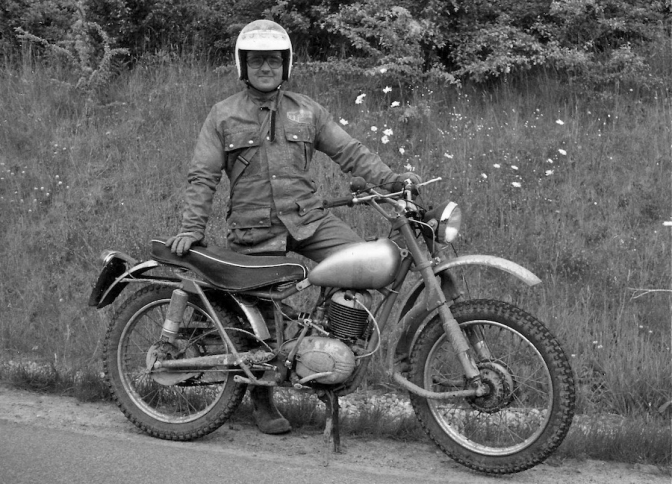 Harry Hulsman started his motorcycle manufacturing business with £1000 capital borrowed from friends. The business produced trials, scrambles and roadster machines powered by Villiers 7E, 8E or 9E engines. Although the motorcycles were assembled in Neath, South Wales most parts were sourced outside Wales. The Villiers engines were produced in Wolverhampton and the frames were also produced in Wolverhampton by DMW. The workforce included Harry, Tom Wheeler. 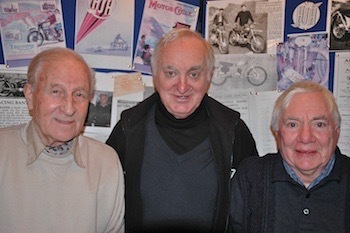 (Production manager and works rider), Hywel Rogers (Mechanic) and Henry's wife who kept the books. HJH was one of many small motorcycle manufacturers set up after the war. Such businesses would hardly survive today but at the time there was a market for small lightweight machines and HJH motorcycles did have some attractive features that made them desirable compared to the opposition. The cadmium coated frame, polished engine cases and chromium plated guards together with Polychromatic paint on the roadster models gave the name some cudos. Harry was a dynamic character and quite a salesman. Tom Wheeler was a respected trials and scrambles rider and Harry enticed him into the business with an offer to double his pay from £6 per week to £12 per week together with the use of a works bike and spares. In November 1955 Harry took various machines to the Earls Court Cycle and Motorcycle Show and gained orders for 1000 machines worth over £100,000. An extensive programme for a small company and unfortunately a lack of capital, shortage of supplies, a railway strike and the lack of suitably skilled labour all combined to bring production to a halt in 1956. 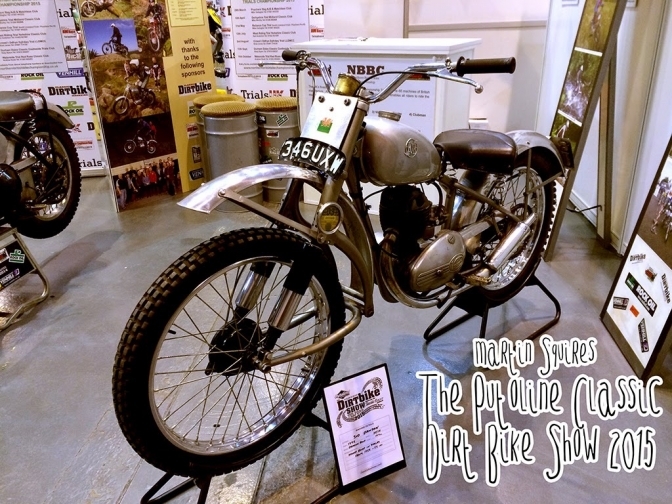 The Motor Cycle Magazine show guide of November 1955 ran the following description of the HJH stand at Earls Court. "Seats upholstered in real hide on luxury roadster models! A number of trials and scrambles machines will be on view at the stand. Both have electric welded tubular steel frames which, to resist the rigours of exposure to mud and water, are dull cadmium plated all over. In addition to the competition mounts there will be on show four Villiers powered roadsters comprising the 147cc Dragonet, 197cc Dragonet Sports and Super Sports models and a 197cc deluxe version of the Dragon Super Sports which has a nacelle-enclosed headlamp". During the three years that HJH Industries was operational they produced 450 machines. producing 5-6 machines per week by working very long hours. The works produced various models including The Dragon which was a 197cc roadster at £80 + purchase tax of £19 4s, and a Trails model at £117 + purchase tax of £28-1s-8p. Tom together with other riders met with considerable success on the trials and scrambles circuit riding an HJH. Rob Griffiths below with his1956 Villiers powered HJH. The business failed in 1956 when Henry ran into trouble for underpaid purchase tax totalling £4,452. The court found him guilty of the offence and he was fined £175 or could serve 6 months inside. A friend paid the fine. A few HJH machines still survive. Six were exported to Australia. Some are still ridden in competition today. This item could not have been written without the help of John Victor who has given access to his excellent archive of materials relating to HJH. The talk given to the club by John Victor and Tom Wheeler on 9th February 2010 gave much background information. Thanks to Rob Griffiths for the photograph of his HJH motorcycle. Tom Wheeler is an honorary member of our club. Many will be unfamiliar with the name but in his hay day Tom was a force to be reckoned with. His talents lay in scrambling and trials riding. The note that follows was written by Tom who is now in his 85th year. Enjoy. In 1947 I first rode a friend's 350cc SV Triumph with girder forks and hand change, afterwards you could keep your cars. The bug had bitten. I saved and bought an ex-army Matchless G3L from Pride and Clarke in Stockwell for £99 a heap of money in those days but it was the only bike available with telescopic forks. I rode it in trials and scrambles using the same tyres for both events, removing the silencer when scrambling. I kept sliding off because of lack of grip so I decided to get a knobbly for the rear. I was offered a managerial position in the motorcycle business, left my secure job as a locomotive fireman on the GWR and the move enabled me to get my hands on a proper bike, a BSA B32 trials machine. That bike helped me to become the East South Wales Trials Champion. My first love was scrambling though so I obtained a scrapped BSA 500 B33; fitted a McCandless swing arm, upgraded and tuned the engine and by 1953 gained the Welsh Scrambles Championship. By this time motorcycles were becoming more available and the competition more fierce. I had to upgrade to a 500S Ariel and it really was a machine. Fast and good looking but not that reliable. I had works support but kept losing races with gearbox troubles or valves dropping. 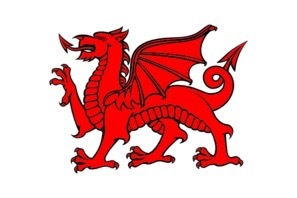 Despite these problems I was Welsh Champion again in 1954. For 1955 I chose a BSA DB500 Goldstar for it's handling and reliability but half way through the season I had an offer from Hussy Hulsman of HJH industries of Neath to work and ride his motorcycles in trials and scrambles. His offer included double the salary I was presently getting. This was an offer I couldn't refuse. As competitions manager I had a free hand to choose the team of riders and Don Price, Gwyn Chambers and Roddy Rees joined me for the season. I continued to ride in trials and scrambles but the 197cc Villiers engine struggled to carry my 14 stone bulk. Due to a lack of financial backing and despite a full order book after a successful Earl's Court Show HJH closed its works in 1956. 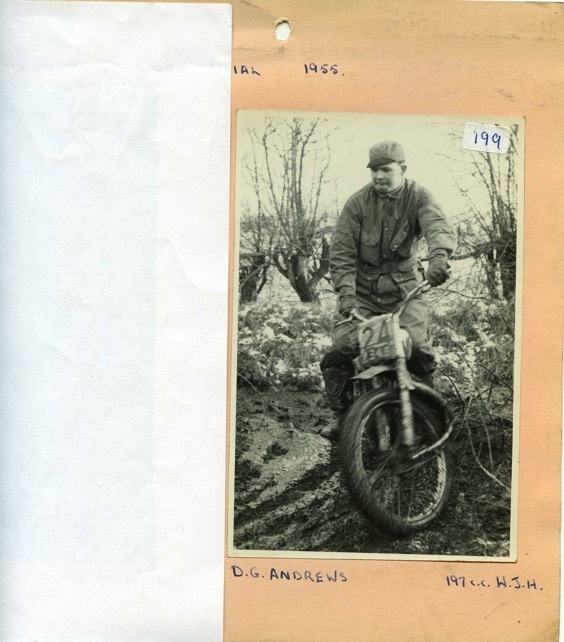 I continued riding BSAs, Nortons, James and Kiefts in both trials and scrambles with varying degrees of success until 1960. I have many fond memories of my riding days but if I had to pick a few favourites they would be the dual with David Tye, who was a works BSA rider, at Flemingstone in 1953 - Leading Jeff Smith, who was world champion at the time, for seven out of ten laps in the 1953 Cardigan Grand National - Racing at Coldra Farm, Newport with Tommy Barker and Cyril Hawkins. Here is a fine shot of a HJH Trials bike. taken by Martin Squires of Sketchbook Travel. Thanks for the use of the photo Martin Courtesy to you. Martin does some fine sketches of motorcycles if you are interested the link to his site is below. Jim Switzer has just sent me these photos from the Bob Dunwoody collection. 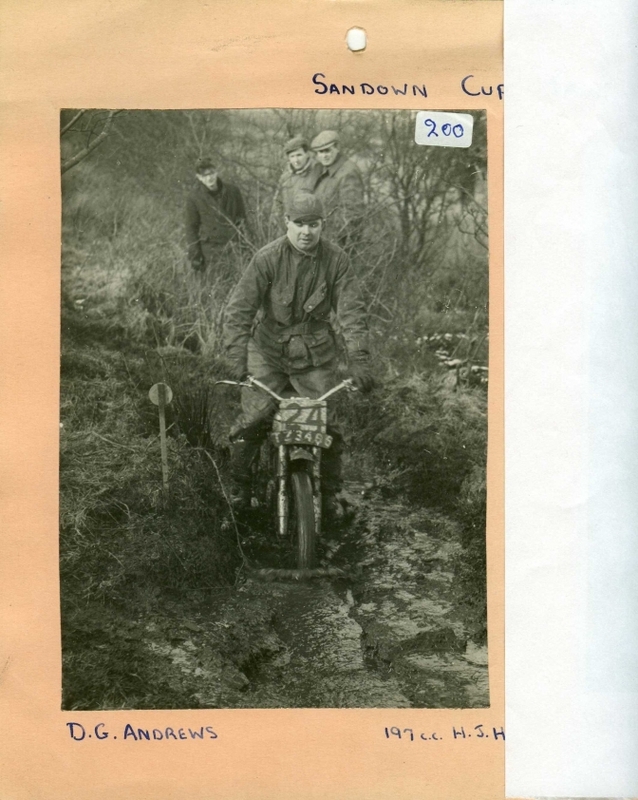 This is Davy Andrews 197 "HJH" in the Sandown Cup trial in Northern Ireland. Davy was an agent for HJH motorcycles in Belfast at the time. It is such a shame that, HJH Motorcycles had to close for a stupid tax evasion issue that would I am sure have been put right, if they had been allowed to turn out the 1000 bikes they had on order. I can tell you running a small company is not easy, We had the ideas but No one wanted to back us then, or later.